David Ackerman has been watching construction at the convergence of Western Avenue, Federal, and South Common streets for weeks and wondering what lies ahead. “I don’t know what to make of it,” said the 71-year-old retiree. 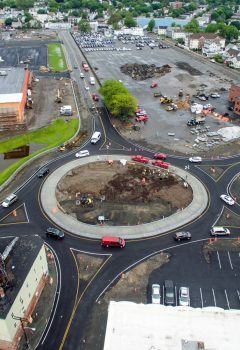 By the end of June, the congested, and some say unsafe intersection near Market Square in front of the new Market Basket will be transformed. The traffic lights are gone, a rotary has been built and the two lane road has been reduced to one. Traffic makes its way around the new rotary. James Cowdell, executive director of the Economic Development & Industrial Corp. (EDIC), the city’s development bank, said the $2 million infrastructure project is being fully paid for by DeMoulas Super Markets Inc., the Tewksbury-based chain store. Originally, the city was in line for a $2 million MassWorks grant to provide road, sidewalk and traffic signal improvements on Western Avenue and Federal and Boston streets to make the former General Electric ‘Factory of the Future’ site more accessible for supermarket customers. But the deal with the state fell through and DeMoulas stepped up for fill the void, Cowdell said. In addition, he said DeMoulas has also pledged $1 million on landscaping in and around the new market. Scheduled to open in August, the $30 million project will give the popular retail grocery chain a Lynn presence and provide 400 jobs, with hiring preference for Lynn residents. Former Ward 7 City Councilor and councilor-at-large candidate Rick Ford and co-owner of the Little River Inn, the popular diner on Boston Street, said so far, customers have been saying good things about the new traffic pattern. “People are saying it’s messed up there now, but the changes should help to fix the traffic jams,” he said.